Keep rules to a minimum. State rules clearly. In some cases, "stay in your area" may mean having a square taped to the floor around the desk. Putting one toe over the line would mean being out of the area. Provide students with a hierarchy of consequences, both positive and negative. Compliance means rewards. Noncompliance means punishments. Be as good as your word. If three talk-outs in 15 minutes earns 3 minutes in a cool-off chair, then stick to it. Don't get mad and send the student to the chair after two talk-outs. Don't let six go by before responding. Don't promise rewards or punishments that are not possible. Only demand behavior that can be enforced. Be specific about what students must accomplish. 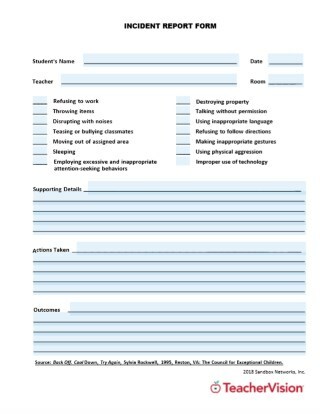 Telling a student that a special activity will be earned if he or she has been "on task" only invites arguments. The student will inevitably claim that he or she was trying to finish. Model the appropriate response for the children at every opportunity. Discuss your behavior as well as the students' positive steps toward self-control at regular times each day. This technique works slowly over time. While it does not produce instant, measurable changes in behavior, it is a powerful tool of instruction when used consistently. As closely as possible, have the punishment fit the crime. Sitting in a chair in the corner for being off task doesn't make as much sense as missing all or part of a special activity while completing the task. Teaching students that their behavior is under their control and that consequences are more often than not a result of their own behavior is the toughest part of the educational process. A student who completes the work on time can be told, "You have chosen to get your work done even though you felt like quitting. Now you have time for a special activity. Aren't you glad that you decided to use your time wisely today?" Keep power struggles to a minimum. Set limits by using impersonal, measurable criteria. Timers that "ding" to signal the end of an activity, for example, are easier for some children to respond to than the teacher's telling them to stop. It is also helpful to post schedules, dally independent work assignments, and lists of rules and consequences on walls and bulletin boards for students to refer to. Be positive. Setting limits is healthy. It does not have to be done in a rude or hostile way. Firmness does not mean intimidation. Set limits by requesting behavior that is incompatible with the undesirable behavior. Many times it will be far more effective to say "Hands at your sides!" instead of "Don't hit!" Give students choices. The fact that they have choices should be a constant topic of each conversation concerning behavior. An example might be "I see that this assignment is taking longer than you had hoped. You may choose to finish it now or you may use part of your lunch period to complete it. The work must be done by the end of lunch if you plan to attend the special activity period. You may decide when you want to finish the assignment." Use physical proximity to help students correct their own behavior. Moving closer to a student who is off task, talking, or showing signs of agitation often results in compliance without a word being said directly to the student. Redirect attention to get students out of stressful situations before they lose composure. Select students who are acting appropriately to go on errands or do jobs. Stapling papers, filing, collating worksheet packets, and cleaning chalkboard erasers are common favorites. This strategy can divert a child's attention, prevent a fight, and give the teacher time to deal with students who are acting inappropriately and/or instigating misbehavior. Other situations that this technique applies to include academic stress relief and helping overactive children find acceptable uses for their energy.